Our basic soap with a fresh, clean sophisticated scent geared for gentlemen or gentlewomen. Reminiscent of fresh scent of fresh air and the Irish country side. 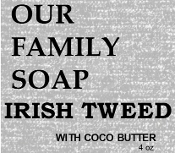 Olive oil, coconut oil, palm oil, Lye (sodium hydroxide, necessary for soap making), proprietary blend FO coco butter, vitamin E. 4 oz bar.